Title is self-explanatory. I know that this question is bit too dumb. But I don't know how to say for sure if a puzzle is enigma or cryptogram. Both of them has a message to decipher. So, finally, What is the difference between enigma puzzle and cryptograms? A cryptogram is a puzzle where letters are replaced by some other symbols in a one-to-one cipher. The most common type involves letters being replaced with other letters, but numbers and symbols are also acceptable. So, for instance, A could be replaced with G; B could be replaced with I; C could be replaced with Q; and so on, with random letters chosen and none repeated. The goal of a cryptogram is often to decode the message. You can see that each letter on the bottom corresponds to one letter on the top, and vice versa. An enigmatic puzzle is one where the solving method is not given. Some great examples of enigmatic puzzles are BmyGuest's "hyper-modern art" series, like this puzzle and this one. They are also common in puzzle hunts such as the MIT Mystery Hunt, ΣUMS, and P&A Magazine. 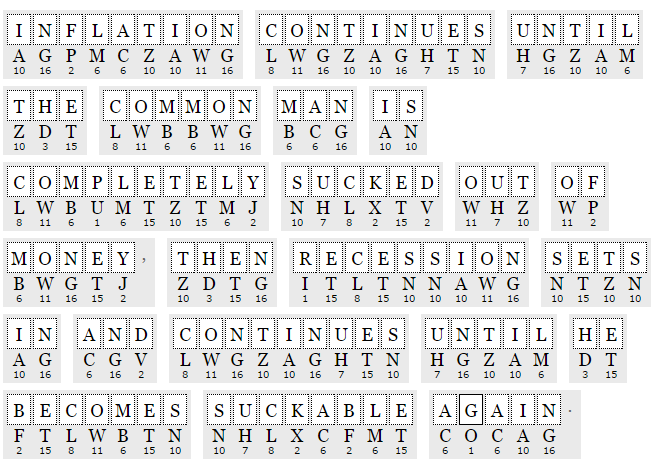 "Enigmatic puzzles" frequently involve a leap of intuition hinted at through the puzzle's framing; their solutions are usually a common English word or phrase. The title is the same as the title of a Japanese poem called "Iroha"; it is an alternate ordering for their syllabary. 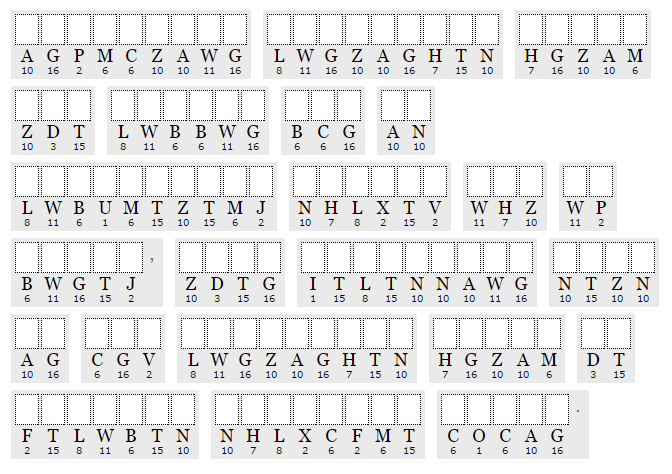 The letters in the grid are laid out in the same way as the syllabary; in this layout, each row represents a consonant (or possibly none) and each column represents the vowel that follows it. If you read off the letters in the order their corresponding syllables appear in the poem, you get the message "PLURAL OF WORD THAT FOLLOWS SHRINK GIFT SANDWICH OR BODY". All of those words are commonly followed by "wrap": "shrink wrap", "gift wrap", "sandwich wrap", or "body wrap". So the answer to the puzzle is "WRAPS".